When you prefer visually sleek and deceptively strong windows, then you should go with Sliding Windows. This type of windows have ample glass area and smooth gliding action. Both sashes slide horizontally for almost effortless opening and closing and lift out for convenient cleaning. The heavy duty construction and lightweight fit ensures excellent performance and protection. Unobstructed view. With these windows you can get wider unobstructed view of the outside world. Larger window opening gives more natural light and better ventilation of the room. Easy operation. Usually each part of the window slides to the right or to the left, it means you can open them with a push of a finger. That's especially helpful in hard to reach areas. Low maintenance. 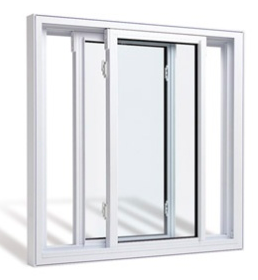 With less moving parts slider windows are much more durable and easy to maintain. These windows can last for many years without giving any big problems. Sliding Windows are very easy to wash. All the maintenance can be done from the inside of the house. Both sashes of the window can be easily removed from the window frame. It is especially handy when you need to put something bulky into the room through the window opening. ﻿In the hard to reach areas, Sliding Windows are good option to have. Especially they come handy in the kitchen, where cabinets make it harder to open a window, but the Slider makes it easy. It is a great pleasure to use Sliding windows.